World MotoGP champion, Valentino Rossi finish second in the circuit Motegi, Japan, Sunday (2009/4/26). That started the race without qualifying session Saturday because of heavy rain yesterday to take the ongoing dry qualifying results from Friday practice sessions. Not the usual "Vale" to a bad start, this time go directly to Rossi at the front of the start. 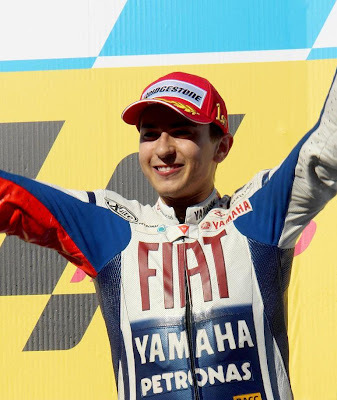 Rossi is able to lead the race until mid-race before eventually defeated by Lorenzo who is a friend of his team in the Fiat Yamaha Team. Towards the end of the race lap Rossi and Pedrosa had a fight to grab the second position. It appears that, Rossi still want to give the action on race day with the turnover frequency for the second position. Maximum racing action going on in some of the last curve, Rossi defeating Pedrosa to fight with Lorenzo. The distance between the "X-fuera" with "The Doctor" that reaches over 2 seconds can be pursued only half. As a result, until the end of the race, Rossi is not able to overcome Lorenzo. Finally, Lorenzo and sweep the race followed by Valentino Rossi and Dani Pedrosa at Motegi in 2009. Meanwhile, the bad start made by Casey Stoner. The Ducati is direct loss of position and fall back to the position of some order. One of which is through Dani Pedrosa, although the Spaniard in the start position 11. 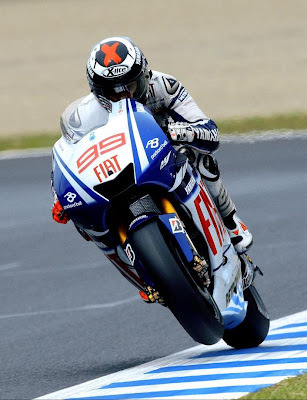 One thing of interest in this race Motegi in 2009 when Marco Melandri is able to occupy the sixth position. This is a surprise for the Kawasaki decided to leave MotoGP. Because Hayate Racing Team motor will never be developed for a future season, was still competitive. So, Kawasaki leave MotoGP is a wrong decision? Let's see the next MotoGP News in Hot Biker. I expect the tournament's MotoGP Motegi Japan. It was wonderful. Thanks for sharing. Các bạn cùng tải game avatar 222 về điện thoại tại đây, và game đánh bài iwin 270 cực hay nhé, hay thử đấu súng với những pha đối chiến nảy lửa với tai game dot kich nữa nhé, chúc các bạn chơi game vui vẻ. tai game dot kich mien phi tại đây nhé. Thư giãn với tai game kim cuong trò chơi mini nổi tiếng. Giới thiệu trang tai facebook tieng viet giúp bạn có thể sử dụng dễ dàng hơn. Cách tai facebook cho dien thoai nhanh chóng và tiết kiệm thời gian. Trang tổng hợp tai game chien thuat hay và chọn lọc cho mobile.